Have u heard of Al- Ansar Steak House? Or may be some of u have been there and tried their Western food! Well, last night I managed to go there and try their food. The place is at AU2 Taman Keramat. It's a corner lot single storey terrace next to Al - Ansar mosque. You can also enjoy the beautiful view of KLCC from the place. I guess the steak house is named after the mosque. What do you think? 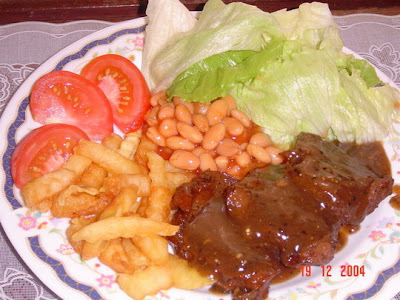 We tried the Black Pepper Steak, Chicken Chop and Beef Steak. Guess??? How much did we have to pay for 4 plates of Western cuisine, 3 glasses of fruit juice, a mug of Nescafe, a glass of iced barley and a glass of warm water? The total bill was RM44.20! What do u say about the price? Was it cheap or .......?? Of course, I have found myself another place for a delicious and cheap Western food besides the one in Putrajaya! And definitely, I'll be coming back to Al- Ansar Steak House again!! Thinking of Switching To NGV, Anyone? Minyak Naik Lagi.... Apa Nak Buat? ?